Tandem Kayak vs. Single Kayak? What are the differences? How and where you will be using your tandem kayak? If you like going kayaking with your partners or your family members sharing one kayak, you will know about the tandem kayak. There are a lot of benefits that a tandem kayak can bring to you. For examples, they are the ability to bond with other people and the increased speed and power- to name just a few. 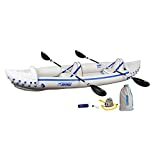 Best tandem kayak needs to be the most suitable model for the types of water you often go kayaking in. There are also many other things that you need to take into consideration including the type kayak, its weight, and length. In case you are looking for a suitable kayak, read our ultimate buyers guide below to see all you need. The difference between a single kayak and a tandem kayak is pretty clear. A single kayak provides only one seat option while the tandem kayak, also known as double kayak, offers two seats. Both of the two kinds of kayaks have their pros and cons. In general, a tandem kayak can provide more functions and versatility than a single kayak. For example, when you are in a tandem kayak with other people, you will have more time to look at the wildlife around you. You also have time to rest. In case you don’t have much experience, sharing a tandem kayak with someone who can help you a lot. Another good point of having a tandem kayak is that you can take out one seat when you go solos. Therefore, it provides a lot of space for your gear and stuff. However, you cannot add one more seat to the single kayak. Moreover, with its limited weight capacity, you might have to hire another single kayak when you invite other people to go kayaking with you. On the other hand, a single kayak can overweight a tandem kayak in some points. First of all, if you prefer to go solo and have as much freedom and control as possible, choose a single tandem. And although a tandem kayak can have you reach a high speed, you can do so only when both of the kayakers can paddle in sync. With a single kayak, you are in full control of the boat. Also, a single kayak is less heavy than a tandem one. The heavy can be a big issue if you have to carry it for a long way. A tandem kayak is a great choice for anyone who has little or no experience in kayaking before. If you have never been going kayaking before, for the first few trips, you can go with someone who has a lot of experience. He will share the same boat with you and guide you how to kayak properly. As I mention just above, a first-time kayaker will benefit a great deal from sharing a tandem kayak as he can learn a lot. His wellbeing is also ensured as someone who can handle the situation is in charge. Even if you have experience, you can also gain benefits from a tandem kayak as well. For example, when you are tired, the other person on a boat can take care of you. Also, when you’re unfamiliar with a type of water, sharing a tandem kayak with an experienced kayaker will ensure your safety at the highest level. Many people think that since a tandem kayak is much heavier than a single kayak of the same size, it is slower under water. This is not true at all. In fact, a tandem kayak has a long waterline, which can provide a more efficient hull- meaning that you can reach a higher speed. Also, when two people paddle, the power will be greater than when one paddle, hence your kayak will go faster. When kayaking with your companion- your family members or your friends, you will have a great time bonding with them. When the water is quiet and calm, you can have time talk and share stories with each other. Finally, a tandem kayak can provide you a lot of space with its long shape. When you go kayaking solo, there would be even room for you to store your sea kayak and other equipment. You can remove one of the seats, giving you, even more, space for your belongings. First of all, you need to think about where you often go kayaking most often – whether it is a calm lake or a rough river. Also, you need to think about what you are going to do when you go kayaking. A tandem kayak for fishing will be different than a tandem kayak for sightseeing. Therefore, make sure you plan it out first as this would help to narrow down the choices you have a great deal. The length of a tandem kayak will determine how much stability you can have. In general, a narrower tandem kayak is more stable. Nevertheless, if you aim for a high-speed kayak, a longer one is the better option. Most of the tandem kayaks are heavy. They weigh about 75 to 100 pounds each. Choosing different types of material will vary the weight. For example, if you choose a plastic tandem kayak, it will be heavier than a composite kayak. If you want a lighter tandem kayak, you might need to look for a shorter one. However, you will not have much stability as you can get from a longer kayak. As the name suggests, this tandem fishing kayak is for fishing. It is very durable and can prevent fishing hooks from puncturing. It also has a large storage area to for you to keep all of your fishing rods and equipment. A tandem fishing kayak also features fishing pole holders. If you want to go kayaking for saltwater fishing and sightseeing, you can consider purchasing a tandem sea kayak. This type of tandem kayak is made to endure big waves from the ocean and be stable enough to prevent from turning over. The material of a sea kayak is also less vulnerable to the damage of salt and than other kinds of a tandem kayak. If you don’t have a lot of space and prefer some kayaks which can you carry around with ease, then a 2-person inflatable kayak is the best. It works just as well as hard shell kayak while giving you a lot of control and ease and maneuvering. Not to mention that most of the inflatable kayaks only take 5 to 10 minutes to inflate. There is two main type of seating options – the sit-in and sit-on-top. Sit-in: Sits inside also shelter your lower body from the wind. Therefore, it can make the kayaks much more beneficial for paddlers who want to be in the cooler water and stay dry while paddling. One downside of the sit- inside tandem kayak is that you don’t have the same freedom to move inside of the water. If you do flip for some reason recovering is a hard process because you’re kayak will be filled with water. Sit-on-top recreational kayaks are very stable fun and easy-to-use. They have large cockpits, so they are not confined, and some even have waterproof compartments that are accessible through hatches in the deck. Sit-on-top: You can get in and out of a sit-on-top kayak quickly. Also, you won’t feel any sense of confinement. Another great point of this option is that it can help the kayak to be very stable. However, be prepared to get pretty wet while you sit on top of a kayak. In case you intend to go kayaking with your children, it is better that you choose a kayak whose cockpit is not too deep. This will help the children reach the paddles much more easily. In case sometimes you go kayaking solo, you can buy one with a removable seat. Removing the seat when you go solo will provide you more space for your belongings. If you want the best control over the kayak, make sure you buy one with rudders. They are optional but most popular tandem kayaks on the market have them. This 12 feet tandem kayak has two plus sits on top seats with the weight capacity of 425 lbs. It features bows, stern as well as two molded-in seat wells. It also has gear straps, overlapping food swells and molded in handles. Besides, the prime material of this kayak is molded polyethylene, and the structure of this kayak is rigid with multiple hulls. The product’s dimensions are 20x34x144 inches with the weight of 63 pounds. With its huge capacity, this tandem kayak is perfect for a couple with a child. You can also load a lot of stuff on a boat with this unit. It is very lightweight and compact while providing you all of the stability and maneuverability you need for most peaceful areas of water. Although it is compact, it still provides a large room for tall kayakers. With its smart design, it is easy for you to carry and launch the boat onto the water. One of the easiest kayak to use for beginners that give you a lot of control. It cannot perform well and provide much stability in rougher water. Therefore, this kayak is the best use for recreational activities. It is safest for you to use on flat and sheltered water and should not be used in rough water. It also cannot give you the highest speed in case you are interested in racing. It is relatively more expensive than other tandem kayaks on the market. It is a two-seater inflatable kayak with the weight capacity of 650 lbs. It is made from PVC with two inflatable PVE seats. This kayak can be inflated in 8 minutes to the size of 12’6″x34″. It features two carry handles, one self-bailing drain valve, five deluxe one-way valves and two skegs for tracking and speeding. It has three chambers at the floor, port, and starboard. First of all, this kayak is very lightweight with huge weight capacity. You can carry up to 3 people and a lot of gear on it. Maneuvering on the water with this kayak is also very easy thanks to its smart and innovative design. With a patented Polykrylar hull, it has a great resistance against sharp objects, and you don’t have to worry much about punctures. The seats are padded so that it is very comfortable to sit on it for a long time. Besides, it also has the huge space room for your most comfort. With its effective drainage system, this kayak can repel water from the inside very well, keeping you and your gear as much dry as possible. It is an inflatable kayak, meaning that you can inflate and deflate it whenever you want. It is easy to carry around and store when deflated. The product offers three years of warranty with the 180-day risk-free trial. Also, there is a pump as well as paddles and repair kit included in the package. The carrying bag that comes along with the kayak is quite difficult to put the kayak and bring it around. This kayak is made from heavy duty puncture resistance vinyl. There are two separate air chambers with Boston valves for quick inflation. This kayak also features two adjustable seats with backrest, removable skegs and grabs line on both ends. The floor is made with inflatable I-beam. Its overall length is 10’3, is super puncture, ’ and its overall width is 3’. Lastly, Its maximum weight is 400 lbs. The package comes with a 86″ Aluminum Oars & High-Output Air Pump. It has all of the benefits of an inflatable kayak with the easy of transport and storage. It is very lightweight and compact so that you can easily bring it everywhere. It also comes with high quality and durable materials super puncture resistance to minimize the risk when the boat bounces against tough and hard subjects. The design is streamlined, which can give you ease of control and padding, especially if you have just start kayaking. The seats are flexible and comfortable, which also give you a lot of room for your legs. Furthermore, these seats are removable so that you can change for a new seat when one is worn out. Also, you can also take off one seat to give space for your belongings in case you go kayaking solo. Since the handles are also made from a lightweight vinyl material, if you hold these handles too tight, the might be twisted. Also, the paddles are quite stiff to work with, especially when you have just used the kayak for the first few times. 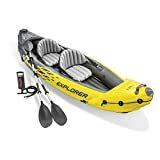 Although this kayak is suitable for the calm and mild body of water, it would be hard to navigate it around the tougher body of water. Overall, a tandem kayak is your best option if you want to share a kayak with other kayakers. If you are a new kayaker, you can get help from your experienced partners sharing the same kayak. There is a huge selection on the market for you to choose from including sit on top or sit in kayak. There is also tandem kayak for calm lakes or rougher water. The choice for you is limitless, and you need to pay attention to various features including length, weight and optional features such as rudders. I hope with this guide; you would be able to identify what you need in a tandem kayak and then can proceed to make the most informed choice, buying the best tandem kayak that caters all of your needs.